“It is a part of sinful human nature to build barriers that shut out other people. In New Testament times one of the greatest barriers was between slaves and freemen, especially between slaves and their owners. Those who were free looked down on slaves as being inferior, slightly above animals. Many slaves looked on their masters with contempt and resentment. Consequently, one of the greatest problems of the early church was in getting Christian slave owners and Christian slaves to treat each other as spiritual equals. “For the most part, women were also looked down on as inferior beings. Husbands often treated their wives little better than they did their slaves. When a wife became a Christian, her entire life, outlook, and value system changed. An unbelieving husband would likely divorce her simply because she had made such a radical decision without his consent. We must not forget as well, the constant animosity between Jews and Gentiles. From the very beginning with Abraham’s two sons, Ishmael and Isaac, this has been an issue. 4000 years later, the struggle has only become worse with nearly the whole world taking sides between Israel and Palestine and current affairs right now in the Middle East. All of this division and strife between people is just another result of sin. But Christ came to remove all results of sin in all of its forms. Ephesians 2 tells us what two of these forms are and what Jesus Christ did to change them. I’d encourage you to turn to Ephesians 2 so we can look at it together today. And so far, we’ve already seen the first change wrought by Jesus Christ. 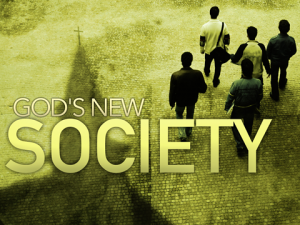 The first change that we have in Jesus Christ is a new position as individuals. Although we are all sinners and deserving judgement, God stepped in and gave us a new position in Christ. Rather than death and destruction, we have deliverance. We have peace with God and have been seated with Christ in heavenly places. All of this we have already seen in Ephesians 2:1-10. That was our new position as individuals. The rest of Ephesians 2 tells us about the new position we have as a corporate body—as a church. And just like with our new position as individuals, Paul tells us what our condition was like before we were saved. As unsaved individuals in Ephesians 2:1-3, we were dead in our sins; dead to God. We lived in a state of blame, accusation, vengeance, violence, and retaliation. But God stepped in and brought to us a whole new way of living (Eph 2:4-7). We were raised up to a life in Jesus Christ that is the life God always wanted for us and which He had planned and prepared for us since the foundation of the world (Eph 2:8-10). Now in Ephesians 2:11-12, Paul once again reminds us of the condition in which we walked as unbelieving members of this world. Paul reminds us that we were separated from each other. We were at animosity with each other. Of course, this is nothing new. We all know this. We get in argument with our spouses or our children. We disagree with our coworkers, or have heated discussions with our neighbors about their dog or the condition of their yard. Sometimes, these arguments are held at an international scale, and when they cannot be resolved, wars ignite, and many thousands of people are killed. Rivalry, blame, accusation, scapegoating, violence, and vengeance. These are the things that ruled and guided our lives. All of these damaged relationships are the result of sin. Now if Paul was writing today, he could have written about blacks vs whites, Republicans vs. Democrats, rich vs. poor, police vs. inner city residents, or even something like Christians vs. Muslims. 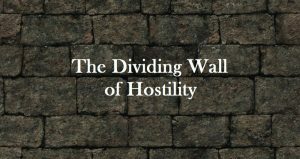 The one aspect of this that Paul wants to focus on in Ephesians 2:11-12 is the hostility that existed in his time between Jews and Gentiles. This was not just an ethnic and racial division, but also a religious one. 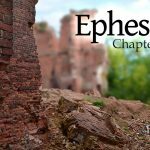 In these verses, Paul tells the Ephesian Christians what the condition of their relationships was like before they were saved. Let’s begin by looking at Ephesians 2:11. In order to see how much God has done for us, it is sometimes wise to remember what our condition was like before we were saved. The word remember is an active imperative in the Greek. In other words, it’s a command. We are commanded to remember our past, not to become guilty about it, but to remember how awful our former life was in comparison to what God has given us now. Ephesians 2:11 is unique in the New Testament in that it is the only verse that tells us to remember our old way of life. In fact, in comparison with other passages like Philippians 3:13-14 which tells us to “forget what is behind” it seems to contradict. But when looked at carefully, both are really saying the same thing. We are not to remember so that we wallow in guilt and depression from past mistakes. Rather, we are to remember our past so that we can see what Christ has delivered us from. Memory is a wonderful gift from God. We need to remember sin, and its effects in our lives so that we can work hard to avoid it in the future. We also need to remember the biblical stories and the times in the past when God has worked on behalf of His people. Christ tells us to take the Lord’s Supper in remembrance of what he has done for us. Remembering our sinful past is also a way to deepen our humility. Sometimes, we start to think that the way we are now is because of our own effort and ability. When we remember, as Paul commands us to do here, the way we were without the grace of God in our lives, it reminds us that the way we are now is due to God, and not our own effort or ability. Paul is talking here about the differences between the Jew and the Gentile. Prior to Abraham, there was no difference. But God, in choosing Abraham, created a difference. Now God created this difference so that His people could be a blessing to everyone else. The problem, however, was that many Jews saw this difference as a reason to boast and be proud and think that they were superior to the others. But God did not choose Abraham so that the Jews would think they were superior to the Gentiles, but so that they might be a blessing and a help to the Gentiles. And the aspect that Paul mentions here in Ephesians 2:11 about this difference between Jew and Gentile is circumcision. Since circumcision was the outward sign of the covenant with God, the Jews considered any uncircumcised male to be outside of God’s blessing and purpose. The Jews were proud of this outward sign of the covenant, and they despised anyone who was not circumcised. In fact, “Jews said that the Gentiles were created by God to be fuel for the fires of Hell; that God loved only Israel of all the nations that he had made; that the best of the serpents crushed, the best of the Gentiles killed. When a Jew went on a journey and returned, before he stepped back into Israel, he would shake the dust off his feet because he didn’t want to bring Gentile dirt into the holy land. As we can see—the Jewish people at that time were arrogant, and despised Gentiles. But this was not always the case, and is not the case today either. In Ephesians 2:11, Paul, although he was a Jew himself, mocks their arrogance by saying that the Jewish circumcision which they took so much pride in was nothing more than something done in the flesh by the hands of men. In Philippians 3:2, Paul calls them “mutilators of the flesh” and in Romans 2:29, he shows us that the real circumcision that God desires is not of the flesh by the hands of men, but of the heart, by the Holy Spirit. It is those who believe in Jesus alone and not in their own works of the flesh that are circumcised of the heart and not of the flesh. So the first thing Paul wants them to remember is that they were Gentiles—despised by the Jews. They were without respect. What Paul means is pretty obvious. They did not have Christ. The Ephesians lived under the same problem that the rest of the world live under. They still, just like everyone else, lived under a system of rivalry, violence, scapegoating, blame, slander, accusation, and victimization. The Ephesians, for the most part, worshipped the goddess Diana, and before the coming of the Gospel, knew nothing of Jesus Christ. They were without Christ, and as such were under condemnation. Many people ask “What about those who have never heard about Christ?” Paul tells us here that without Christ, they are lost. So, the Ephesians, before they were saved, were without respect, they were despised by the Jews, were without Christ, and next, were aliens from the commonwealth of Israel. Another way of saying this is that we were excluded from being a part of God’s people, or excluded from citizenship with Israel. They were without citizenship. They were separate from the special blessing, protection, love, covenants, priesthood, sacrifices, promises and guidance that God gave to Israel (Deut 32:9-14; 33:27-29; Isa 63:7-9; Amos 3:2). When we become Christians, we join in some of the benefits of being the people of God. The issue of the relation between Israel and the church has always been debated. But whatever conclusion we come to, three things are clear from Scripture (Romans 11). Number 1, the church has not replaced Israel. Number 2, Gentile believers have been grafted into Israel so that we somehow share in some of the blessings that Paul is talking about here in Ephesians 2:12. And Number 3, God is not done with Israel. He still has promises and a plan to fulfill with Israel at the end of time. We’ll talk a bit more about this next week. So, we were, thirdly, without citizenship. The fourth item to remember is very similar. He says in Ephesians 2:12 that we need to remember how before we were saved, we were strangers from the covenants of promise. God never made any covenants with Gentile nations. Gentiles were included in the covenant with Abraham, and since Noah lived before Abraham, we could consider him as a Gentile, I suppose, but in broad terms, God did not make covenants with Gentile nations—only with the nation of Israel. Gentiles were considered strangers and aliens—and the Jews never let them forget it. Before they became Christians, then, they were without respect, without Christ, without citizenship, and without covenants. Fifth, from Ephesians 2:12, they are to remember that before they became Christians, they were without hope. That describes the life of the unsaved person, doesn’t it? (cf. 1 Thess 4:13). I saw in the newspaper this past week that depression is at an all-time high. People have no hope for the future. If they lose their jobs, and their health is failing, their possession are threatened, and they see everything they have worked for go down the drain, people get depressed, and since they have no hope for the future, sometimes they commit suicide. But Christians do have a hope for the future. We will see this more clearly in Ephesians 2:19-22, but no matter how bad things get now, we can know that we have everlasting life in paradise after we die. There is great hope to found in that. And finally, we are to remember that we were without God in the world. The term here in the Greek is atheos from which we get our word “atheist.” Now, the fact that they were atheos doesn’t mean that they didn’t believe in God. Just the opposite in fact. Rather than being atheists the way we think of them today, the Ephesians were pantheists. They believed in many gods. Remember Paul’s sermon on Mars Hill in Athens? He talked about all the gods they had. So it was not an issue of them being without gods, it was that they did not know the one true God. They were without the God of the Bible. And that final phrase, in the world, reminds us of Ephesians 2:2 showing us that it is not a good thing to be in the world. So the six things Paul lists here as descriptive of what the Ephesian Christians were like before they were saved are: without respect, without Christ, without citizenship, without covenants, without hope and without God. And all of these six things caused enmity and hatred and discord between Jews and Gentiles in those days. Some of these are true of us as well before we were Christians, right? We too were without Christ, and without citizenship, and without covenants with God, and without hope and without God. In Ephesians 2:11-12 Paul has been talking specifically here about the enmity that is between the Jew and Gentile. And we could apply it today to other races that have had histories, but to apply it for us, we need to get a little more specific to the situation at the time of writing. We have already seen that many Jews hated the Gentile with a passion. We saw that many Jews considered Gentiles as nothing more than fuel for hell. And we say, “Wow, that’s extreme” but there are many Christians who feel proud about being a Christian, and look down upon non-Christians. This, I believe, was exactly what was going on in Ephesus, but it still goes on today. The Ephesians Gentile Christians had started to look down upon their non-Christian neighbors and friends with scorn and derision. They had started to feel superior, to feel smarter, to feel like God loved them more than anyone else. You were called to be part of God’s family for the same reason that Abraham was called and the Jewish people were called and all of God’s people are called … not to lord your position over others and think that you are smarter and more blessed than others, but rather to be a blessing and a help to them. To love them. If you start to treat others with hate and derision, then you are still living in the way described by Paul in Ephesians 2:1-3. We used to live lives of rivalry, blame, accusation, scapegoating, slander, and violence, but now God has called us to live lives of love, forgiveness, grace, faith, and blessing. If we go back to blaming, accusing, scapegoating, and judging the world, then we have learned nothing about Jesus Christ or why He came. Are you as horrified as I am that certain Christians feel this way about the unsaved? We wonder how the Jews could have hated the Gentiles so, but then we look at some of our own brothers and sisters hating non-Christians in the exact same way! None of us, I hope, feel this way about any non-Christian. None of us, I hope, despise our neighbor because they are not Christians. Rather, we love them, and are concerned for them, and want to share with them the love that Christ has for them so that they too may be saved. That is the Christians duty. That is our God given responsibility—to bring blessing, not cursing. So since none of us look upon unbelievers this way, let’s get a little more specific. Every passage in Scripture is profitable for teaching, and this one is no different. What does it have for us today? 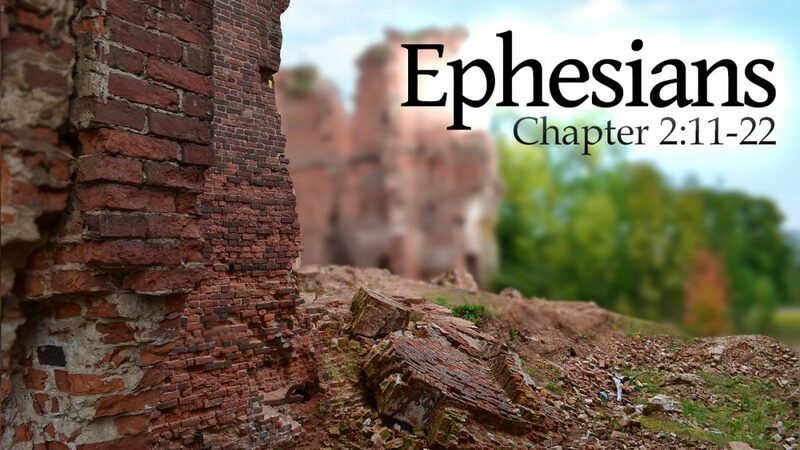 In order to find this, we need to get a bit more specific about the circumstances the Ephesian church was in. In the days of Paul, many Jews had rules about what a person could or could not eat. They had rules about what a person had to wear, and what festivals to celebrate in which way and on and on and on. They had over 6000 of these types of rules. And the Jews would not associate with anyone who didn’t try to keep all of these rules, which meant they would not associate with Gentiles—even if they were Gentile Christians (cf. Acts 10; 15; Gal. 2:11-13). We don’t struggle with these kinds of things in the church today, right? We’re past all of this rule keeping, right? … Or are we? When we really examine this ancient problem, and we examine the life of the church today, it is like looking in a mirror. We have conflicts between denominations, within denominations and in churches with no denomination. We have disunity between Christians and non-Christians, and even within churches full of Christians. But the issue is no longer circumcision or who has access to the covenants of promise. Churches have split over the kind of music that is played, or how much music is played. Or what kind of instruments are used to play the music. Churches have split over what sort of ministries and programs a church should have, who should lead them, who should attend them and how they should be held. Churches have split over dress codes. Should people wear shorts and T-shirts or three-piece suits? Should women wear full length dresses or allowed to wear skirts or pants! Churches have split over something the pastor said, or something the pastor wore, or how he prays. Churches have split over whether to have male or female pastors. 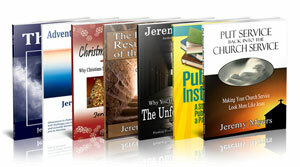 Some churches have rules about going to the movies, wearing cosmetics, playing cards, watching television, going to the beach, not having a “quiet time” every day, going to a restaurant that sells liquor, wearing certain clothing, driving certain cars, wearing certain jewelry, listening to certain music, dancing, holding a certain job, wearing your hair a certain way, having certain possessions, drinking coffee, eating certain foods, drinking certain drinks, celebrating certain holidays, reading certain books, or certain magazines, etc., etc., etc. The point is not whether they are wrong or not, the point is whether we let them divide our fellowship or not. In the days of Paul, it was the 6000 laws of the Jewish Talmud. Today, we could come up with 6000 laws of certain Christians. Attitudes have not changed—only the rules. And when we focus on those rules and regulations, they will divide a church faster than anything. Paul is telling the Ephesian Christians that these things are the way they were as unbelievers. Sadly, in many churches, this is the way Christians still are. The rules and prejudices have changed since the time of Paul, but not the attitudes. And in the two verses before us today, we don’t have a solution. But Scripture never presents a problem without giving an answer. Earlier in chapter 2 we saw the problem of sin, but God stepped in and provided a solution—justification by grace through faith. Today we have seen the problem of disunity, and next week we will see what God has provided so that Christians and churches can grow in love and harmony, at peace with each other in Christ. David Engelsma, quoted in Vance, 293. Chuck Swindoll, Grace Awakening (Dallas: Word, 1996), 164. Hey Jeremy, thanks again for this article, with your posts it seems if I am not learning something I am being convicted of something. Your truths and studies are so much appreciated, this time I am convicted.. of a few things. Thanks. Jeremy please help me, I don’t want to send you a seventh message, but a few times I accidentally said that God was in league with the devils. I know he is not, I want to go to heaven, I want to still have a chance. I want to celebrate Christmas, I want to be Google holy and righteous. Please help me Jeremy please help me, sincerely Mitchell firestone.